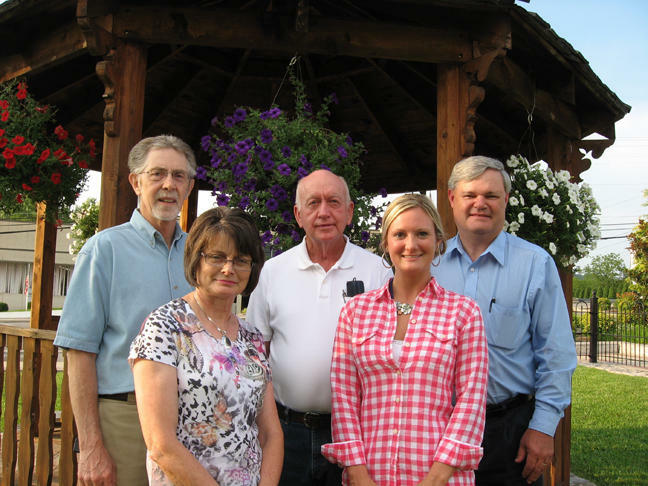 Cannon County Audit Committee members are, left to right: Glenn Steakley, chairman, Pat Sissom, Ed Sissom, Hope Tenpenny, secretary and Gary Hancock, vice-chairman. The group was formed at the recommendation of the State Comptroller. At the recommendation of the State Comptroller, the Cannon County Commission approved Resolution 211-04 in October 2011 to form an Audit Committee. The purpose of this committee was to establish an independent review and oversight of the county government's financial reporting process, the government's controls, review of the external auditor's report, and follow up on corrective action and compliance with laws, regulations and ethics. The five members serving on this Committee are either retired or employed in the private sector. The Cannon County Audit Committee was established to answer the call to assist in the monitoring of Cannon County's financial integrity. Its mission is to objectively assist in the monitoring of the independent audit of the county's financial statements. Specifically, the Committee will assist in monitoring the following: questioning the independence of the outside, independent auditors? the results of the audit? and the assessment of the adequacy of internal controls by both the administration and the auditors. It is committed to upholding continued excellence in Cannon County Government. Each member of the Committee agrees that they will remain independent of any county employee, county office or county official. The Committee carefully reviews all audit findings in the audit report before meeting with the state audit team. The Committee works with the county's department heads and makes common-sense recommendations to correct and eliminate audit Findings. The Audit Committee is not an enforcement committee, but one that works closely with county officials to implement corrective actions that will, hopefully, prevent future audit Findings. It is the responsibility of the department heads and county legislative body (County Commission) to correct the deficiencies found in the state audits as a part of their accountability to the local taxpayers. The Committee assists in monitoring the independent and state audits of the county's financial statements, from interviewing the auditor(s) to providing advice on the resolution of audit Findings. It also examines the appropriateness of the outside audit's scope, the audit results and the assessment of the adequacy of internal controls. The Committee uses various proven problem-solving techniques to determine the root cause of the Findings and a common-sense approach when determining Corrective and Preventive Actions. These actions will be found to be the most economical possible due to the Committee's dedication to being good stewards of the county's taxpayers' money. The objective is to suggest cost-effective solutions that will achieve long-term gains. Gary Hancock: A lifelong resident of Cannon County, active in community and civic organizations. Mr. Hancock is a 26 year employee with DTC Communications and currently holds the position of Chief Operating Officer (COO). He has served as Vice-Chairman since the Committee was chartered in 2011. Ed Sissom: CSX Transportation management for 25 years, 8 years working out of corporate office in Jacksonville, Florida. Served as Cannon County Road Commissioner for 2 years. Most recently, has owned a small excavating business for the last 4 years. Mr. Sissom is a charter member of the Committee. Pat Sissom: Worked in both the Cannon County Clerk's office and the office of the County Executive. Ms. Sissom has owned and managed Briar Rose Flowers and Gifts for the past 20 years. She is a charter member of the Committee. Glenn Steakley: Twenty-five years' experience in manufacturing and facility management and sixteen years' experience in quality and engineering management, developing and implementing quality and management systems. Active in community and civic organizations. Mr. Steakley has served as Chairman since the Committee was chartered in 2011. Hope Tenpenny: A Certified Public Accountant, Mrs. Tenpenny also holds a Masters of Accounting. Currently serves as Director of Accounting at Reeves-Sain Family of Medical Services and Vice President of Finance of the Junior League of Murfreesboro. Past experiences include treasurer of Murfreesboro Young Professional and Auditor with Dempsey, Vantrease & Follis, PLLC. Active member and volunteer for multiple civic organizations including, but not limited to the United Way of Rutherford & Cannon County, Child Advocacy Center of Rutherford & Cannon County, Cannon County Walking Horse Association, Discovery Center, and Special Kids. Mrs. Tenpenny has served as Secretary since the Committee was chartered in 2011. Two (2) Committee members will be required to "roll off' at the end of the 2013 year after a two-year term. They will be replaced by new members approved by the Cannon County Commission. Members of the Audit Committee do not receive compensation for their service. The Cannon County Audit Committee looks forward to continuing to work in good faith with the officials of Cannon County to enhance transparency, improve internal controls and increase overall operating financial efficiency.